In June 2014, there was an outbreak of tornadoes concentrated in the Great Plains that significantly impacted the State of Nebraska killing 2 and injuring many others. Every year we are threatened with the possibility of severe weather and every day LiteForm Technologies in South Sioux City, NE is helping homeowners who are in the process of building design and build a structure that is safe and secure, a Safe Room. 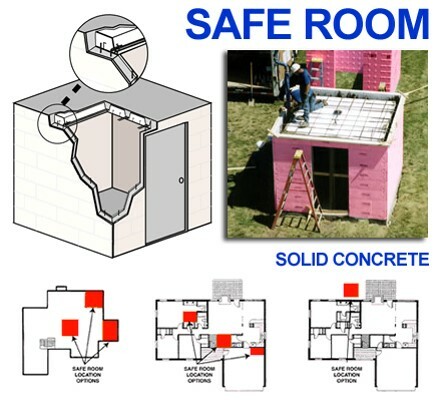 Concrete Safe Rooms can be incorporated in to any building plan, whether you are in the process of building a new home or plan to add on to your existing home, a Safe Room can easily be built above or below ground utilizing Insulated Concrete Forms (ICFs) and LiteDeck forms from LiteForm. Forming concrete is simple, fast, energy efficient and building with concrete results in strong, sustainable structures proven to still be standing after a devastating storm. When you are in the design stages of your project, consider the idea of a concrete Safe Room built with LiteForm and LiteDeck forms. LiteDeck resists the damaging power of Mother Nature and offers supreme performance against tornadoes, hurricanes, hail and fire. LiteDeck’s solid, reinforced concrete joists and cover is recognized by the Federal Emergency Management Agency (FEMA) to be an effective “envelope of protection against deadly weather.” Engineered spans of 40’ or larger can be designed without additional supporting beams or posts.